A formal welcome and reception space is made inviting through vibrant colors and transparency. Arium AE began working with Music and Arts representatives from the onset of the project to assist with the conceptualization of a collaborative space that met today’s modern office standards but could also accommodate Music and Arts’ technical studio requirements. The project team selected a three-story office at 5295 Westview Drive that had recently undergone exterior façade improvements as new Music and Arts’ new home. One floor was allocated for current and future office staff and a portion of the second floor was slated for a music studio and information technology equipment. 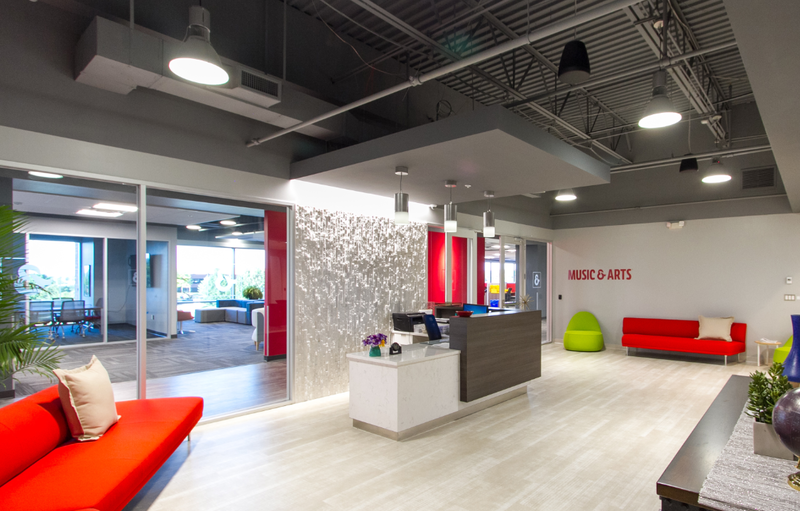 Being able to occupy 1.5 floors of the building gave Music and Arts the flexibility to create the collaborative work space they desired. Equally important, the space provided ample access to daylight and views of the western mountains and to the community they serve. Access to light and collaborative spaces were key concepts carried throughout the project. The concept of Light and Bright lead the removal of window blinds, the lowering of cubical walls and offices fronted with large glass walls to allow natural light to penetrate deep into the floorplate. An Open Floorplan design encouraged the selective removal of ceilings to expose a higher deck above and provide the sense of a larger space. Sustainable materials were utilized and featured throughout the space. 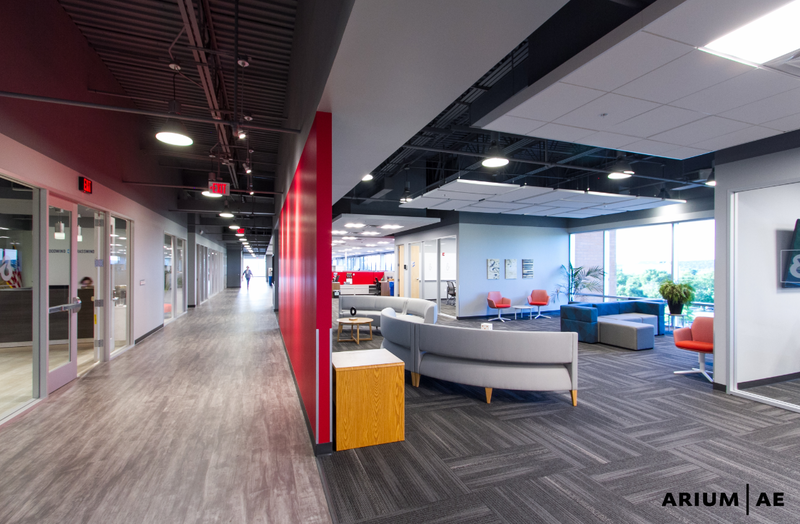 Acoustical ceiling tiles made from basalt rock and over 42% recycled content were floated within the exposed deck above to accent collaboration areas and reduce reverberation. The design incorporated several energy efficient technologies, including the use of LED light fixtures and daylight zoning. The perimeter lights in the suite can be dimmed separately when there is adequate sunlight. Solar window film was added to the windows to reduce heat gain. A sense of community and collaboration was encouraged throughout the open plan design. A sense of community was created through the use of a variety of collaboration areas. These areas range from glass enclosed huddle rooms to simple beanbag chairs in an open office adjacent to a mountain view. 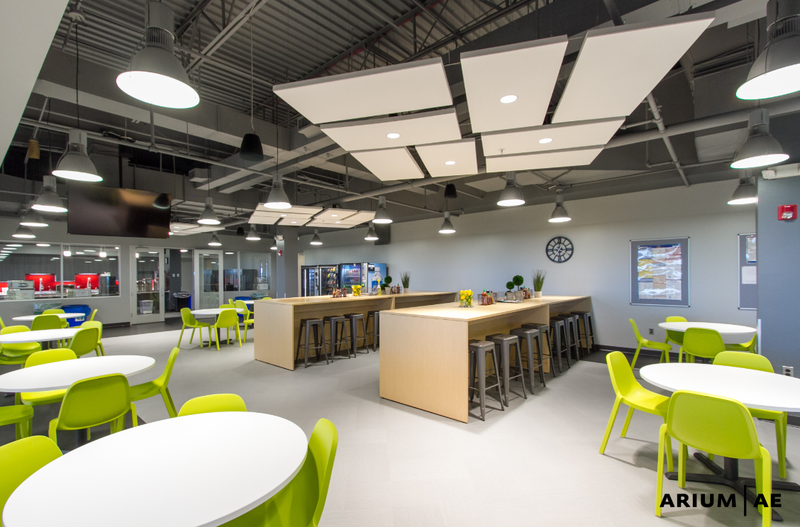 A large break room was also designed to allow for food and beverage amenities and allow staff to come together for their breaks and gatherings. Arium AE and the project team encouraged the Music and Arts staff to share in the design of the space. A number of staff concepts were incorporated, including a teal accent that was used to represent a past staff member who survived cancer. The end result was a new modern office space that not only met the client’s technical requirements but also greatly improved their corporate collaboration and ownership of the office space.